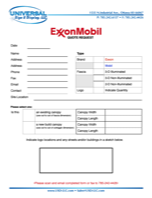 1) Click the thumbnail to the right to download and print the quote request form. 3) Scan/email the form to Sales@USD-LLC.com or fax it to 785.242.4426.
and provide feedback as quickly as possible. We look forward to serving you!